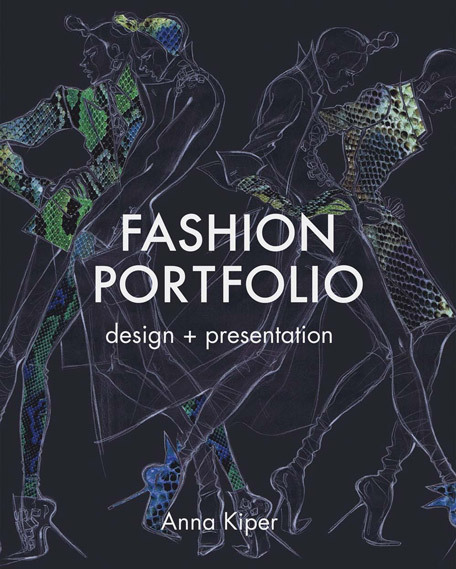 Whether you are a student applying for a fashion course, an aspiring post-graduate hoping to get employment, or an established professional seeking for new carrier opportunities you know that the quality portfolio is essential to work your way up as a fashion designer. 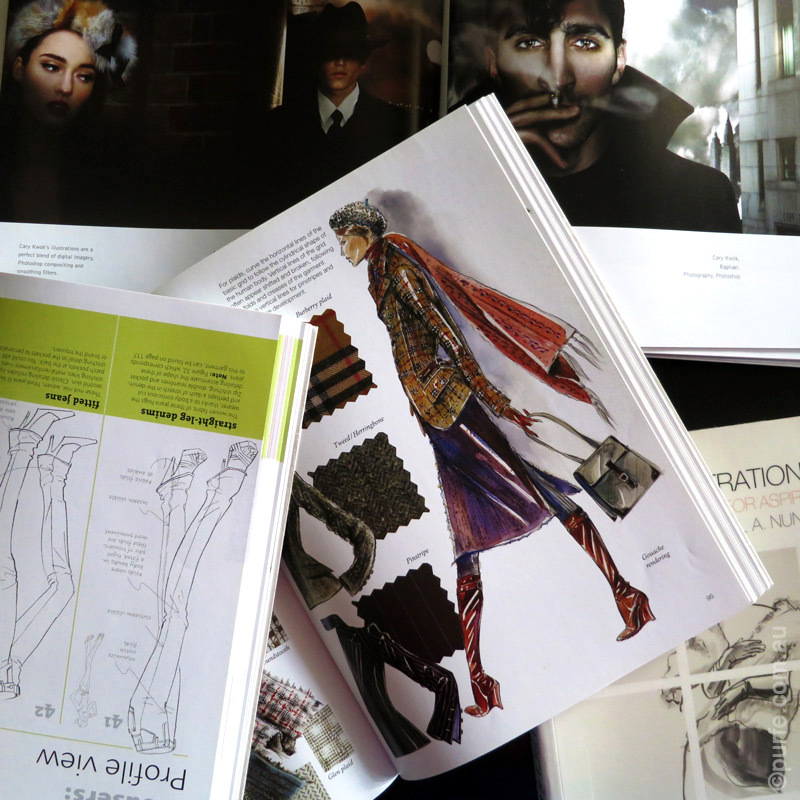 There is a book that will help you with just that: to create an impressive fashion portfolio – Fashion Portfolio: Design & Presentation by Anna Kiper. 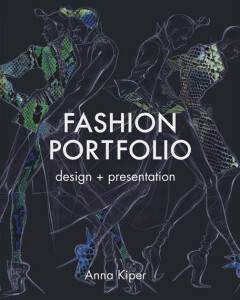 Fashion Portfolio: Design & Presentation is a large format book that takes the reader through the complete process of creating a fashion portfolio from concept to presentation. 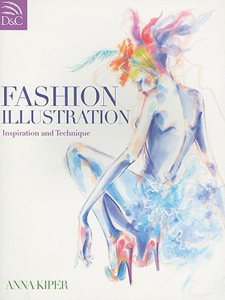 The book is written in clear and explicit language lavishly complemented by beautiful photographs and illustrations. The structure guides the reader through all the major steps of fashion portfolio creation. 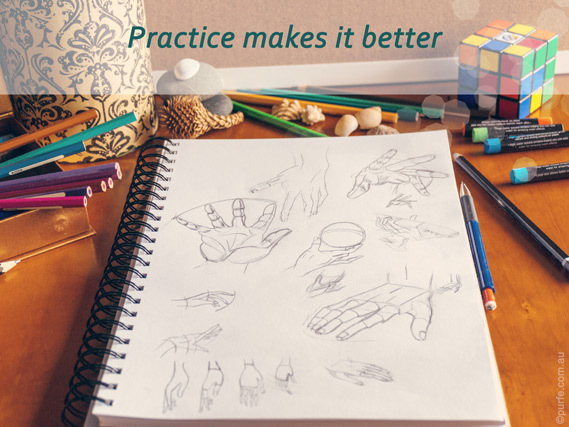 It delves into the fundamentals of each of subjects and touches almost all aspects of design. 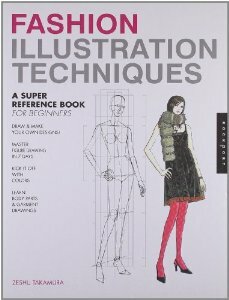 This is a kind of book that shows the reader ways to think, how to develop a collection and how to create a portfolio. Through the pages Anna Kiper helps the reader to build a vision of the design process. 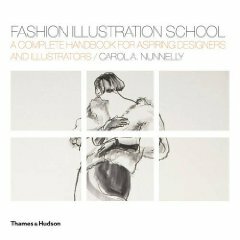 She gives the necessary creative framework, highlights hidden reefs and offers valuable advice on how to organize and control creative process, making your efforts effective. 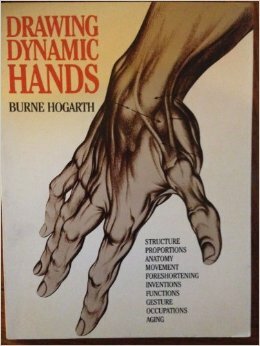 The book explains the process of creating collection in a contextual manner, calling for consistent and logical approach entangled with certain idea, mood and theme. It gives the reader a glimpse into designer’s mind, demonstrating the way ideas revolve and are coming together into collages, mood boards, sketches, garments and, finally, into a complete collection. 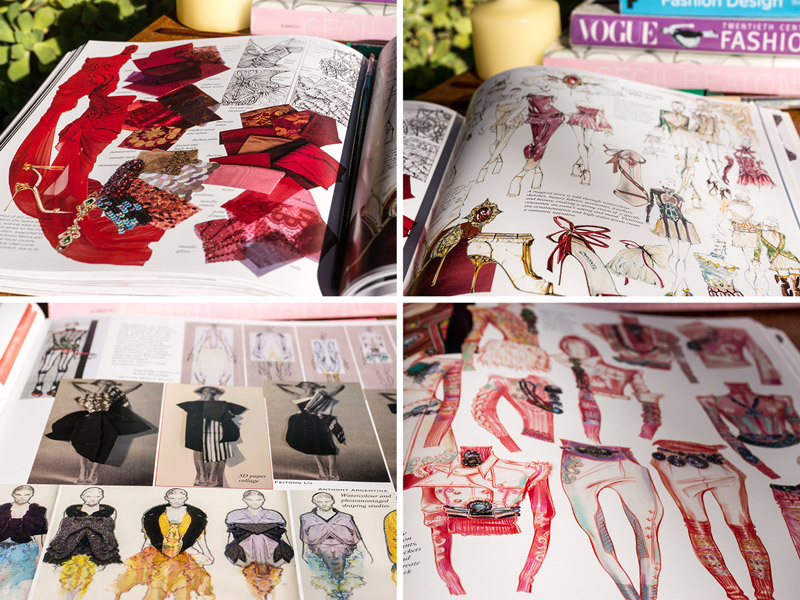 But the greatest thing is that Fashion Portfolio doesn’t set anything as right or wrong, it leaves all doors open for you showing that inspiration could be found in very unusual places. It induces to ideas, not sets the path. Australians love to shop and market responds accordingly bursting with great variety of brands and labels to satisfy every demand. As I have mentioned before many fashion brands are part of a bigger groups and holdings. With generous investments and high-class management often provided by big companies it is easier for small brands to survive market competition and improve overall performance. Australia is no exception from this rule. 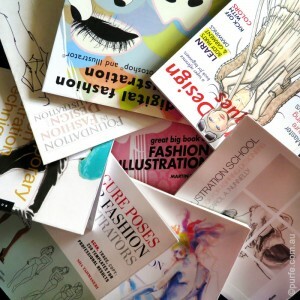 If we have a closer look on fashion market we will notice that numerous brands are operated by a handful of companies. 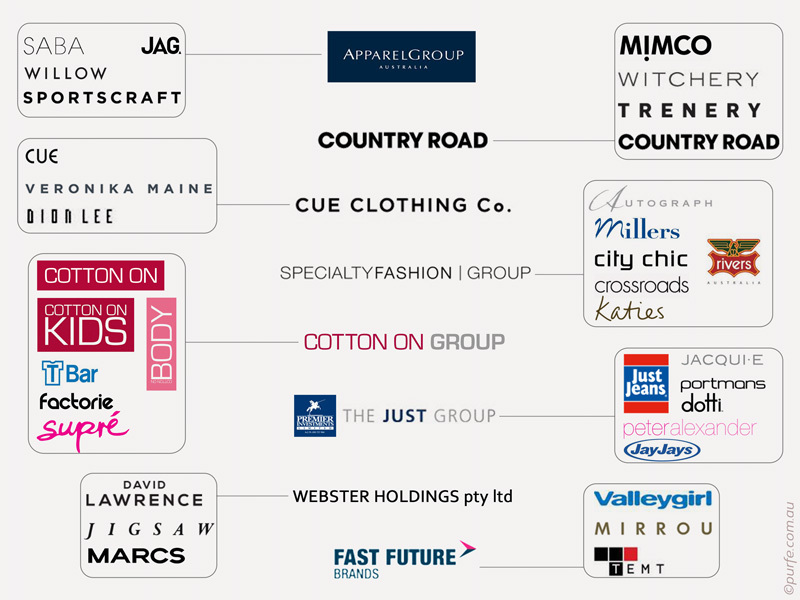 34 of the most popular Australian fashion brands are owned or controlled by only 8 companies. The question who owns whom is quite popular and the answer to it costs a lot. Want to know who owns Millers fashion or Autograph brand? Have a look on the table below and you will find that these brands along with city chic, crossroads, Katies and iconic Australian brand Rivers belong to the largest retailer of women’s fashion in Australia – Specialty Fashion Group. Other popular fast-fashion clothing retail chain Cotton On operates Cotton On Body, Cotton On Kids, Rubi Shoes, T-bar and Factorie and has Supre brand as its subsidiary. Such middle market clothing and accessories brands as Mimco, Trenery and Witchery are part of Country Road Group. Websters holdings are managing classic brands Jigsaw, David Lawrence and Marcs. Most of large companies in the table above are Australian and privately owned. 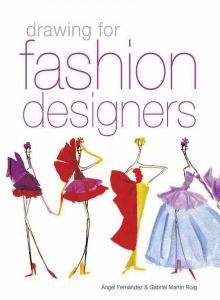 Myer, Australian department store chain, owns 65% of famous Australian women’s fashion label sass & bide. Dion Lee label is acquired by The Cue Clothing Co., though it remains independent from Cue and Veronika Maine. South African company Woolworths Holdings Limited is the ultimate parent entity of Country Road Group and owns 88% of its shares. ↑The American Business Information Company Dun and Bradstreet in associations with GAP Books publish annual directories in which provided the relationship between companies worldwide showing who is the ultimate parent company and who are their subsidiaries. Each compendium sells for more than £ 600 pounds and gives excessive information about global market. While looking for a way to organize and logically structure my own wardrobe I came across different approaches. It was quite a mix from colour priority method where all your items are put in a line of rainbow colours (or Pantone palette) to “grab and go” style where items hanged together formed a ready to wear outfit. The problem is neither of these methods is optimized for viewing. To put an outfit together you need to pull everything out in order to see what you have, that takes too much time sometimes. For me organized wardrobe is not only of a tidy appearance, but also allows to create looks easy and fast, to keep track of items I have, and to see if my new purchase will match any of it. The solution comes from Google play – the wardrobe organizer apps. I really like the concept of having the entire wardrobe on a palm of my hand. I downloaded and tried most of closet sorting apps. Here is my pick of the best 5.